Dorset’s Douch Family Funeral Directors have joined forces with a local charity to help finance child bereavement courses for up to 200 teachers. The company will fund half the cost of ten training courses run by Mosaic, a charity that supports children up to the age of 18 who have experienced the death of a loved one. As well as providing individual support, Mosaic runs residential weekends for bereaved children, young people and their families. The charity would like to train as many teachers as possible throughout Dorset. Nick Douch, managing director of the funeral group, said death was often a taboo subject where children are concerned and it was important they received support. Each year in the UK, 23,600 parents die leaving dependent children which equates to one every 22 minutes. It is estimated that 2,500 children living in Dorset will be bereaved by the death of a close relative each year and 250 of those will need the support of a service like Mosaic. Margaret Hannibal, CEO at Mosaic, said: “We believe it is really important to give teaching staff the confidence and skills to work with bereaved children and understand how they may react to the death of a loved one. “Often teachers just need to know that what they are doing and saying is the right thing. “Every child is unique and will deal with bereavement in their own way. Children may become withdrawn or angry, find it difficult to concentrate and their attendance and academic levels can drop. Nick Douch said: “Adults sometimes don’t speak to children about death, and if they do it can be treated as a fairy tale. “It’s not natural to suppress a child’s inquisitiveness and just answering their questions honestly can really help them deal with the death and understand it. “When people ask my opinion about children and funeral arrangements I tell them to do what they feel is right, and that usually means involving the child. “Just little things like explaining to them what will happen in the Crematorium chapel and what happens to the coffin can often help a youngster deal with it much better. 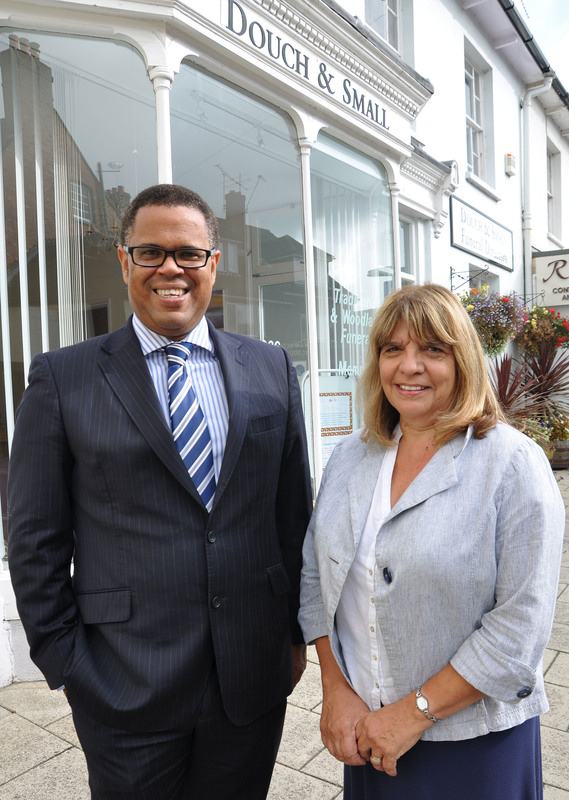 “We are match funding the cost of ten courses, which means the schools themselves pay just 50 per cent of the usual fee.” Staff at the Douch Family Funeral Directors, which are based in Wimborne, Ferndown, Wareham, Poole, Upton, Swanage and Corfe Mullen, will be also be trained by Mosaic. The courses can be arranged with the schools at a convenient time for them i.e. Inset Training Days. Since Margaret co-founded the charity seven years ago staff and volunteers have supported 750 children aged up to the age of 18 and this year expect to support over 120 young people. The Douch Family Funeral Directors have been helping families with funeral arrangements for over 100 years. Branches include Douch & Small, A. E. Jolliffe, Albert Marsh, James Smith, Ives & Shand and Lesley Shand Funeral Service. They are based in Ferndown, Wareham, Poole, Upton, Wimborne, Swanage and Corfe Mullen. The Douch Family Funeral Directors also provide The Dorset Funeral Plan, an increasingly popular way to plan ahead. Mosaic: Mosaic is a Dorset wide charity offering a pathway of support to bereaved children, young people and their families. We also work with young people who are facing the death of a loved one. Mosaic provides individual, family and group support. Every child has the opportunity to attend our residential weekend programme where they can meet others and share their experiences.